Types of Weight Loss Procedures that can save your life. Weight loss although has risks, can be a benefits including curing diabetes, lowering blood pressure, lowering cholesterol, easy joints and arthritis pain, digestive issues. Asthma and lung disease, sleep apnea, pre diabetes, Hepatic Steatosis, non alcohol related cirrhosis, PCOS for infertility, Joint disease, pseudotumor cerebri, uniary incontinense, venous stasis disease which causes swelling and varicose veins, Depression and mental illness, Quality of life. Longer life. The Lap Band, adjustable Banding System. Placement of a flexible silicone band around the upper part of the stomach. the result is your not as hungry, feels fuller faster and eats less. there is a port left under the skin, so the Doctor can tighten the band or make it looser. LRYGB, Laparoscopic Roux-en-Y gastric Bypass, t in involves the creation of a small capacity stomach pouch and a small outlet from the pouch directly into the small intestine, where nutrients are absorbed. The pouch will hold less then the previous stomach, can fee satisfied sooner, eats, Hormonal issues make a difference in your calories being burned. LSG, Laparoscopic sleeve gastrectomy, This removes a large portion of the stomach, the remaining portion of the stomach is formed into a long tube that is unable to enlarge or balloon up with food. The restriction reduces the amount a person can eat and causes satiety with less food. MGB, Mini-Gastric Bypass or loop Gastric Bypass is a laparoscopic gastric bypass the involves connecting a loop of the small intestine to a small stomach ouch, creating the same sense of satiety and reduced hunger This procedure tissue connection instead of two and can be performed out patient. The Duodenal Switch, This procedure involves a more complex re-routing of the intestines, that results in reduced stomach capacity and reduced nutrient absorption, It is the most invasive of the procedures and has the most risks but it may still have a role as a revisional procedure of for people with severe diabetes and very high BM!. Band with imbringcation, This procedure which adds an imbrication or surgical in -folding and tightening of the stomach, to the placement of any adjustable gastric band. this is also out patient procedure it may improve weight loss produce faster results over LAGB Alone. The laparoscopic improvement allow surgeons to spend less time in operating room and usually can go home that day. If you are over 65 most likely you won’t qualify. You may want to keep your decision to have bariatric surgery to your self, the last thing you need is others opinions, it just between you and your Dr. You can even go under another name in the hospital to protect your privacy, but if you want to share your decision, make sure its with positive people that will support you in your journey and help you in your recovery. A fantastic Book to read which gives you the in’s and outs, pro’s and con’s to any Gastric surgery. It is called A Sasse Guide, Outpatient Weight loss surgery, Dr Sasse is a highly experienced and accomplished bariatric surgeon, author expert and featured speaker national in the field of Weight reduction, bariatric medicine, remission of diabetes and surgery. The Bipolar Disorder We Don’t talke about. Although amputations are visible the phantom pains are not. The exact cause of phantom pain is still unknown but originates in the spinal cord and brain. when a patient feels these pains, it can be seen in a MRI machine. It is believed that it is a response from mixed signals from the brain. When a amputation takes place, areas of the spinal cord and brain lose your input from the missing limb and adjust to this detachment in a unpredictable way. It may send a message to your brain the pain is else where. Because the sensory information is referred elsewhere-from a missing hand to a present cheek. So when the cheek is touched its as the missing limb is present. It is a version of tangled sensory wires. Thus results in pain. Phantom pain can be caused by damaged nerve endings, scar tissue at the site of amputation and the physical memory of pre-amputation pain. Know your triggers, usually you can feel a tingle or some sensation before pain begins, Try to empty your bladder, don’t get constipated, drinking alcohol can add to the pain, If you learn your triggers you may be able to stop them before they happen, meditation, calming one self down can prevent the pain. Number one trigger is Stress! so if you can exercise, de stress, calm down, you may be able to find tricks by massaging the limb before bed to help prevent the pain or using a (tens) machine to the affected limb. (TENS), have been found to be effective treatment for those that don’t want to take oral medications. Also more invasive options include injections or implanted devices . This is usually a last resort. Although no medications specifically for phantom pain exist, some drugs designed to treat other conditions have been helpful in relieving nerve pain. Not every pain medication will work for every person’s pain. Antidepressants. Tricyclic antidepressants may relieve the pain caused by damaged nerves. Examples include amitriptyline, nortriptyline (Pamelor) and tramadol (Conzip, Ultram). These drugs work by modifying chemical messengers that relay pain signals. Antidepressants may also help you sleep, which can make you feel better. Possible side effects include sleepiness, dry mouth, blurred vision, weight gain, and a decrease in sexual performance or desire. Anticonvulsants. Epilepsy drugs — such as gabapentin (Gralise, Neurontin), pregabalin (Lyrica) and carbamazepine (Carbatrol, Epitol, Tegretol) — are often used to treat nerve pain. They work by quieting damaged nerves to slow or prevent uncontrolled pain signals. Side effects may include depression, anxiety, suicidal thoughts, irritability, and allergic reactions such as hives, fever and swelling. receotor antagonists. This class of anesthetics works by binding to the NMDA receptors on the brain’s nerve cells and blocking the activity of glutamate, a protein that plays a large role in relaying nerve signals. In studies, NMDA receptor antagonists ketamine and dextromethorphan were effective in relieving phantom pain. Side effects of ketamine include mild sedation, hallucinations or loss of consciousness. No side effects were reported from the use of dextromethorphan. Nerve stimulation. In a procedure called transcutaneous electrical nerve stimulation (TENS), a device sends a weak electrical current via adhesive patches on the skin near the area of pain. This may interrupt or mask pain signals, preventing them from reaching your brain. Used properly, TENS is safe. To avoid an unintentional shock, don’t wear a TENS device in the shower or tub or turn it up too high. Mirror box. This device contains mirrors that make it look like an amputated limb exists. The mirror box has two openings — one for the intact limb and one for the stump. The person then performs symmetrical exercises, while watching the intact limb move and imagining that he or she is actually observing the missing limb moving. Studies have found that this exercise may help relieve phantom pain. Acupuncture. The National Institutes of Health has found that acupuncture can be an effective treatment for some types of chronic pain. In acupuncture, the practitioner inserts extremely fine, sterilized stainless steel needles into the skin at specific points on the body. It’s thought that acupuncture stimulates your central nervous system to release the body’s natural pain-relieving endorphins. Acupuncture is generally considered safe when performed correctly. Brain stimulation. Deep brain stimulation and motor cortex stimulation are similar to spinal cord stimulation except that the current is delivered within the brain. A surgeon uses a magnetic resonance imaging (MRI) scan to position the electrodes correctly. Newer approaches to relieve phantom pain include virtual reality goggles. The computer program for the goggles mirrors the person’s intact limb, so it looks like there’s been no amputation. Along with this pain from amputation, a patient may experience grief of the loss of the limb amputated, also depression over the loss can be common, Loss of activity, or ability to work, or function pre amputation. So support from family and friends are a important part of the recovery of a amputee. One patient told me the pain was so bad he wanted to cut his entire leg off or kill himself. Life was not worth living. After reading this article, I couldn’t imagine saying it any better, Every day is a struggle mentally and physically, but Amani Omejer says it perfectly. Waking up because of pain is the shittiest way to wake up and start the day… A friend recently fell off her bike and explained that she had been woken up the night before by the pain in her leg. She told me that it was such a horrible way to be woken up, and I explained that this is how I’m woken up most nights or mornings… And if I’m not waking up because of the pain, I feel pain as soon as I have woken up in the morning. Waking up and being in pain straight away is beyond depressing and demoralizing, but I’d always pick this one over being woken up by the pain. Both options are so tough, lonely and exhausting, though. They also feel indescribable. Words somehow just don’t do being-in-constant-severe-pain justice at all. For a while last year I noticed that I kept waking up in the morning hoping things might be different. This was more because of emotional stuff that was happening at the time, and for the months beforehand, but the experience was very similar to what I’m experiencing now, except at the moment I’m feeling this hope-for-difference because of the extreme pain I’m experiencing. Last year I was desperately struggling with grief and anxiety (as well as other chronic illness related things!). Each morning I would wake, hoping things would be different, and each morning I felt so sad, heartbrokenly disappointed, and desperately frustrated that it wasn’t… It was exactly the same over and over again, each day, every day, for ages! When I prolapsed two discs in my back in 2013, I remember having this same thing: Six months into being completely bed-bound, I was waking up every day with a heartbreaking hope for difference, and feeling completely crushed and exhausted every morning that it wasn’t. Every time I was still waking up to the same slog of navigating intense loneliness and the constant challenge of somehow getting what I needed each day when I could barely get out of bed. Something eventually shifted, as something always does, but it wasn’t that the symptoms completely eased (the grief/angst still rear their head every day, and my back still gives me troubles), it was just that something else — something more intense — took over dominating my experience. Ugh. 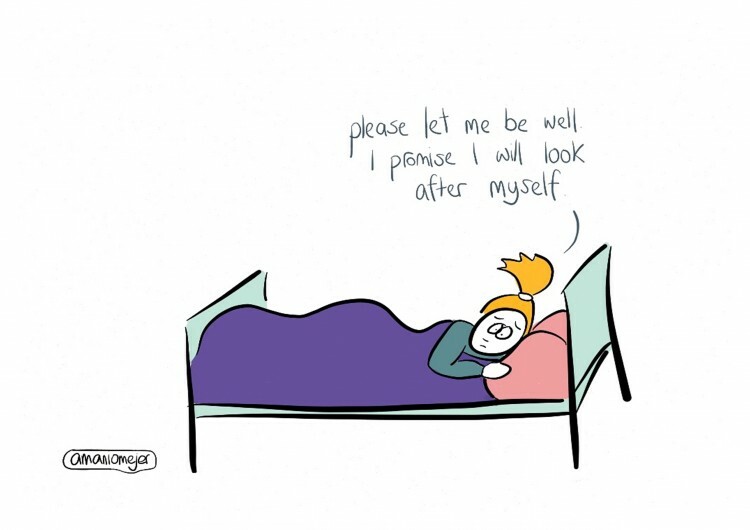 Explaining exactly what is happening, and how many symptoms I’m navigating and have navigated for ages now, always leaves me feeling angry, frustrated, overwhelmed, exhausted, scared, helpless, and really f*cking heartbroken and sad… Living with chronic illness is so, so, hard. So hard. I often can’t believe how much I’m dealing with, so I struggle to trust other people would be able to comprehend it, too. Surely someone can’t have that many things going on and still be trying to exist?! Is that what my head says… I immediately know that isn’t true, but I often talk myself into feeling suicidal because I’m like, surely I can’t keep — and shouldn’t keep! — fighting when I’m experiencing all of this? Surely I should just want to give up and stop fighting to live…? I end up feeling embarrassed that I continue to fight despite my experience, that I haven’t just gotten the hint yet… I feel like an idiot that I’m still trying so hard to live when actually things are just so damn hard in this body of mine. But that is all talk from my inner critic — it isn’t truth, it just feels like truth a lot. Life is difficult — it is beautiful but it is f*cking difficult, too. And we all have differing levels and types of difficulty that we experience, and in so, so, many ways, my life is nowhere near as hard as some peoples’ in the world. But both, especially the latter, just blind us to our experience, our truth: what is actually happening and how we are dealing with it. We get blinded to the fact that we are brilliant. Living with chronic illness is like climbing Mt. Everest over and over again, every single day, except the territory always changes slightly. Nothing is predictable, and it’s really f*cking difficult. I read an article yesterday that has me extremely excited about the implications. The article is called “Hacking the Nervous System” by Gaia Vince (http://mosaicscience.com/story/hacking-nervous-system). In the article, the author describes the experience of a woman who suffered from severe, debilitating rheumatoid arthritis and her eventual treatment with a device which minimized inflammation by simply stimulating the vagus nerve. What this means, is that by activating the vagus nerve which works through the parasympathetic nervous system, we can greatly influence inflammation and the immune system. The role of the brain on body inflammation can be profound. If you suffer from digestive complaints, high blood pressure, depression or any inflammatory condition, please read on. Let me explain the possible implications step by step.